Welcome to my first ever monthly recap! I thought the first week of the new month would be a great time to take a look back on all the blog posts of this last month. 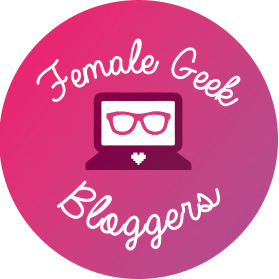 With the first week of November almost behind us, let’s take a look at the month of October here on A Geeky Gal! Well, we were already married. In fact, we just celebrated our one year anniversary on October 21st! Our wedding, however, was October 13th in my hometown in Alabama. I can’t wait to share all the details with you in an upcoming blog post! Have a sneak peek of this dreamy phone shot by my mom-in-law. For the month of October, I was Later Levels’ star blogger and posed a question for their monthly Question of the Month! Along with a cute bio, Kim really rained praise down on my little blog and me. It made me and my blog feel good! With October being my favorite month, I knew my QotM needed to be spooky. My question: In honor of Halloween, tell me what video game scared you the most. What is it about the elements, environments, music, or characters in the video game that scared you? Picking a winner was so hard! I had so many creative answers that weren’t even from horror games! In the end though, I picked my winner. I was nominated for a Blogger Recognition Award by Libarah! I nominated all the bloggers that are participating in Normal Happenings’ Games that Define Us collab. They’re all lovely people so be sure to check out the 7 posts that are up so far! I met a personal goal of surpassing 350 followers on WordPress!